Sales software helps sales managers direct team efforts by tracking metrics, guiding activities and monitoring performance. We evaluated dozens of options and narrowed it down to the top six. We used the most important criteria including activity tracking, monitoring, lead scoring and assignment, affordability and ease of use to identify the best options. Freshsales (Best overall) Organizations with territory-based teams needing call monitoring and lead prioritization tools. Pipeliner Managers looking for highly visual sales management software with dynamic reporting features. Insightly Professionals responsible for managing projects as well as assigning leads and generating new business. Zoho Team leaders who want to manage sales, marketing, orders, and support in one system. amoCRM Businesses looking to utilize a highly automated sales process. Salesmate CRM Telesales managers looking for a CRM with a built-in VOIP. Sales software allows you to track sales activity metrics, provides tools to help you guide and influence sales activities and allows you to monitor sales performance. When considering sales management and tracking software options for small businesses, we looked for sales management tools within CRM software that were easy to use, affordably priced, saves time and allow you to manage your sales team effectively. Based on this criteria, we have determined Freshsales to be the overall best small business sales software for sales management for its robust, built-in tools that help sales managers optimize and assign leads as well as monitor and evaluate sales calls at an affordable price. It is also easy to use and has all of the features listed in our evaluation criteria. Freshsales is the best overall customer relationship management (CRM) tool and sales software because it allows sales managers to prioritize and assign the best leads and monitor and evaluate sales calls with its call recording features. Also, what makes it unique is its mobile app, built-in phone system and ability to support territory-based selling. Therefore, it is a good option for sales managers with territory-based teams who are hands-on and provide feedback on sales calls. Freshsales is affordably priced, starting at $12 per user, per month. There’s also a free version that offers basic lead and contact management functionality for unlimited users. As your needs grow and you require more advanced tools, its prices are highly competitive compared to similarly featured sales tracking systems. The Sprout Plan is the free version, and it offers robust sales management features like call recording to help sales managers evaluate and provide feedback on sales calls. It also offers lead scoring to prioritize the best leads. It even offers role-based access features to help manage what your sales reps have access to and what they focus on. Compared to Insightly and Zoho free plans, Freshsales has no restrictions on the number of users. Starting off with this plan will allow your sales team to make calls from the built-in voice-over-internet-protocol (VoIP) and allow you to track their calling activities and provide feedback. You can even use recordings and results to highlight best practices from high performers, which will raise the bar for the rest of the team. The Sprout Plan is therefore appropriate for sales managers with teams that rely on calling as their main selling activity. Starting at $12 per user, per month, this plan builds on the Sprout plan, providing more advanced CRM tools. It offers advanced lead scoring, advanced analytics and reporting, workflows and the ability to send and track up to 250 bulk emails. This plan is comparable to Salesmate CRM, which also offers a built-in phone system with recording features, email tracking capabilities and advanced reporting and analytics priced starting at $12 per user, per month. Features like advanced lead scoring enhance your ability to focus your team on the best leads. Email metrics also allow you to provide additional feedback on emails and showcase high-performing emails as best practices for the team. Freshsales’ Blossom plan is, therefore, the best option for sales managers and business owners looking to go beyond the basics of sales management. Starting at $29 per user, per month, this plan expands on the Blossom plan, offering territory management, lead scoring by email activity, lead assignment rules and an expanded number of automation workflows. This plan also offers call forwarding and call transfer, which support territory-based teams and is similar to Insightly’s Professional plan priced at $49 per user, per month, with its workflow and lead scoring functionalities but also offers calling features not available with Insightly. This plan is for sales managers ready to segment their sales teams into territories. Tools like automated lead assignments and the ability to purchase and assign national or local phone numbers, call transfer and call forwarding allow teams to engage with assigned leads quickly. Also, activity reports help track sales activities so you can pinpoint areas of improvement and make suggestions. Forecasting tools also help you predict and achieve revenue goals. The Estate plan starting price is $49 per user, per month. It offers expanded sales campaign, lead scoring and bulk email capabilities. It also offers web-to-lead capture forms, additional sales campaigns and additional workflows. 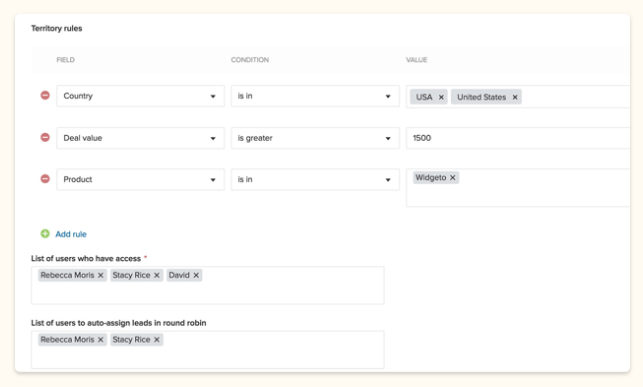 Although this plan offers expanded bulk email capabilities, Insightly allows you to execute bigger email campaigns by enabling you to send 5,000 bulk emails compared to 1,000 bulk emails. The features in this plan allow you to use lead scoring to focus on the best leads, automation tools to capture website leads and sales and email campaigns to target and communicate with the best prospects. The Estate plan, therefore, is great for businesses with territory-based sales teams interested in expanding their prospecting and lead generation activities in a more strategic way. If you manage the entire sales life cycle, from prospecting through project management, you’ll find that Freshsales is missing project management tools. If project management tools are important and are part of your sales management responsibilities, you can always use a tool like Trello, which has an upcoming integration with Freshsales or Insightly CRM that comes with project management features. Freshsales users love the software because they find it easy to use, get great support and includes email and phone integration. Any dislikes fall under the category of minor glitches or that the system can sometimes be slow. For more information on reviews, see our Freshsales review page. Territory-based teams are more focused and efficient with lead assignment and scoring tools. Sales managers can also do their jobs more effectively with the ability to track sales activities and give feedback using call recording and email tracking features. Visit Freshsales today to try these tools yourself by signing up for a 30-day free trial. Pipeliner is the best sales management software for sales managers looking for a highly visual drag-and-drop sales management tool with dynamic reporting features. It includes an easy to read yet comprehensive dashboard that keeps critical information like actual sales vs. sales targets and problem areas with suggested corrective actions in one central location. Therefore, it’s best for highly visual sales managers with sophisticated reporting needs. Pipeliner is affordable, starting at $35 per user, per month. Should your business grow and you need more advanced features, prices remain affordable with the Business plan, priced at $65 per user, per month. There is also an Enterprise option. However, the Starter and Business plans offer the best value for small business needs. The Starter plan, priced at $35 per user, per month offers a basic set of sales management features including standard reporting, dynamic target views and activity reminders, which keep goals and important activities front and center at all times and custom pipeline stages. These features are presented in a more visual way compared to the other options. However, they are also less robust, than Freshsales and Zoho, which offer features like lead scoring at this price point. For sales managers looking for a mid-featured, highly visual entry level sales management tool in the $35 range, the Starter Plan is a great choice. It allows sales managers to keep their teams focused on what’s most important with dynamic target views, activity reminders and the ability to customize pipeline stages to meet specific business needs. The Business plan contains everything in the Starter plan but offers Navigator Dashboard, insight reports, custom roles and permissions, custom activities by pipeline stages and visual sales activities management. These tools help sales managers direct and manage their teams’ activities prominently displaying the most important activities and metrics. This plan is comparable to other options in this article that have similar features. Pipeliner’s Business plan is the best option for sales managers looking to go beyond the basics for the cost of $65 per user, per month. It is best for sales managers looking for more advanced insights that are easy to read through a visual and comprehensive display. Pipedrive is missing a built-in phone system with recording capabilities that would allow sales managers to offer feedback on calling activities. It’s also missing lead scoring and assignment capabilities to help direct their sales teams’ efforts. If these options are important, Freshsales or Salesmate CRM would be better options. 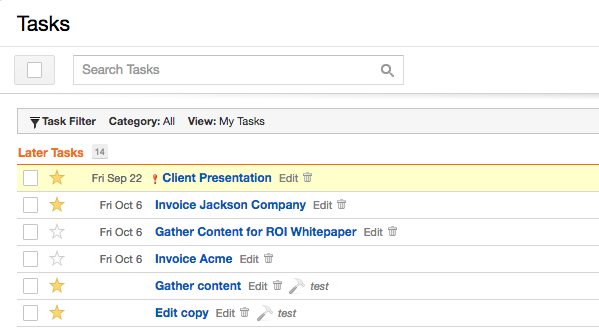 Pipeliner users love that it’s very visual and how it keeps salespeople focused on the most important tasks. Being able to visualize key metrics and activities quickly helps sales managers know where to focus and how to direct their teams. There aren’t many negative reviews for this product. For user reviews, see our Pipeliner review article. 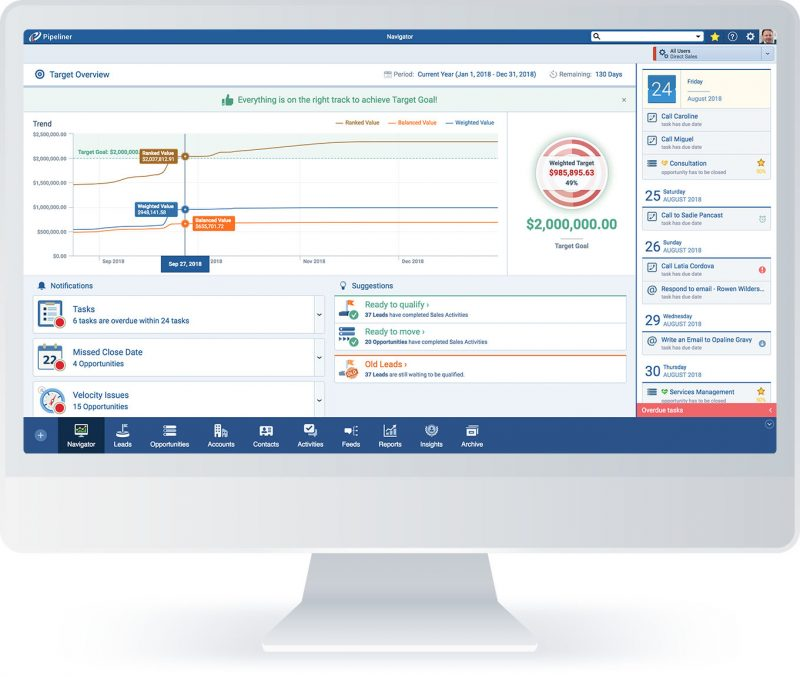 Sales managers looking for sales management software that is highly visually should consider Pipeliner. It’s drag-and-drop features are intuitive to use, and its reports are easy to understand, giving managers to identify sales status and areas for improvement quickly. Best of all, you can try it for free, by signing up today for a free trial today. 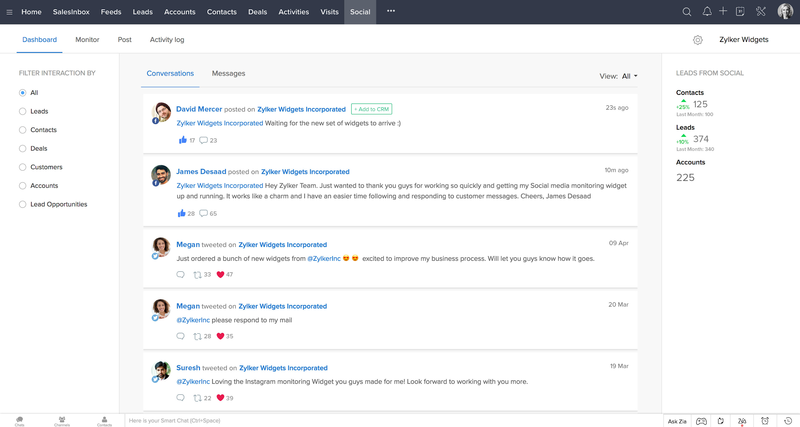 Insightly is a CRM with both sales and project management capabilities. It also includes sales management features such as its unique built-in business card scanner as well as email templates, web-to-lead forms and automated lead assignment rules. Its project management features make it unique and best for sales teams that want to build long-term relationships with beyond the initial sales cycle. Insightly is affordably priced, starting at $29 per user, per month. As your needs grow and you require more advanced tools like workflow automation and role-based permissions, prices are still competitive at $49 per user, per month. The Free plan offers the same core set of task, opportunity, relationship and project management functionality as the paid plans. Where it differs is that only two users are allowed on this plan, and there are many limitations on the size of data storage and record imports. Features are comparable to the free versions of Zoho and Freshsales, but unlike these options, Insightly offers project management tools to help foster long-term relationships. For small businesses with only one or two users looking to try sales management software and plan to manage projects and pursue long-term relationships with their customers, the Free plan is the best choice of the six options featured in this article. It’s a great starter option that is scalable when the business expands its team. The Plus plan offers the features of the free plan and also has some additional ones. The main difference is that there are not as many limitations or restrictions. The price is $29 per user, per month or $35 monthly. Record, storage and email limitations are significantly increased. It’s great if they need to accommodate a larger number of records and a larger sales team or if a team is looking for fewer restrictions on the amount of storage. This makes it a good option for teams like designers, architects, construction industry professionals or anyone working in an industry requiring significant documentation within its projects. The Professional plan offers sales managers even fewer restrictions in terms of the number of records and data storage while offering tools and resources not available on the Free and Plus plans. Sales managers can make their teams more efficient and focused with tools like workflow automation and lead assignments. Sales managers can also customize their dashboards and focus on the tasks and metrics that are important to their businesses. This plan is best for sales managers with medium to large sales teams that may be segmented by territory or product. Tools like lead assignments, role or profile permissions and workflow automation help sales managers better direct their team’s sales activities. Expanded email capabilities like the number of mass emails and email templates can also help sales managers increase team productivity at an affordable price of $49 per user, per month or $59 monthly. What Insightly is missing is call integration, which would complement email integration, where calls can be made, received and tracked right in the software. If this feature is important, Freshsales or Salesmate are better options. Insightly users love the project management features. They like the fact that they can stay involved with customers even after a deal is closed. They also think Insightly could improve on how it approaches training and onboarding. For more information on Insightly user reviews, see our Insightly review article. If your business could benefit from a CRM with both sales and project management tools, consider Insightly. Insightly gives sales managers tools to help build long-term relationships while helping them stay on top of sales activities throughout the entire sales lifecycle. You can sign up for an Insightly free trial to see if it’s right for you. Zoho is a CRM that gives businesses the ability to manage their sales teams as well as marketing, purchasing and invoices. It also offers artificial intelligence powered sales signals that can help businesses direct their sales efforts to their most engaged prospects. What makes it unique is that it combines sales, marketing and order management in one tool. Therefore, it is best for sales managers responsible for sales activities, social selling and managing orders. Zoho is affordably priced, starting at $12 per user, per month. Even at the Professional level, the pricing is very competitive at $20 per user, per month. Zoho allows small businesses to grow without the need for spending more than $20 per user, per month. The Free plan offers the ability to track tasks, events, and log calls. It also includes basic workflow management tools like workflow rules and email notifications, lead scoring and sales analytics and reporting. In addition to sales management related features, users can take advantage of basic social media integration, which differentiates Zoho from its competitors. The Free plan is appropriate for sales managers with three users or less who engage their potential customers on social media. It’s a great starter plan to enable your sales team to execute a social media engagement strategy that will support moving prospects along the pipeline stages. Its structure is similar to Insightly’s free plan, which also has a restricted number of free users. If you need a free plan for more than three users, Freshsales may be a better fit. The Standard plan builds on the Free plan, offering unique features like Sales Signals, a feature that notifies sales reps of buying signals that sales managers can set up in advance. It also offers sales forecasting, which allows you to forecast revenue by team, territory or sales rep. It also offers phone integration to track calling activity and includes advanced marketing tools like mass emails, marketing campaigns and social media lead capture forms. The Standard plan is the best option for sales managers looking to execute and manage both sales activities and marketing campaigns. Pricing is comparable to Freshsales, which has a built-in phone, at $12 per user, per month. The Professional plan, priced at $20 per user, per month builds on the Standard plan and adds more advanced tools like inventory, order management and the Zoho Finance Suite. These tools allow sales managers to support the sales team in managing recurring orders. They also give sales managers insight into any problems with orders or inventory so they can help resolve them, get the product shipped and invoiced. This plan is for sales managers that want to access and incorporate order and inventory information while engaging their prospects and customers. Accessing this information in the CRM can save time from having to log into another system. Screenshot of Zoho CRM dashboard. Zoho lacks the project management features found in Insightly, although this feature can be added and integrated into the software. Zoho has calling capabilities but only with integration with Phone Bridge. Therefore, Zoho is not as out-of-the-box ready as the other products we compared in terms of sales management. Zoho users like the fact that the software is very comprehensive. However, some are disappointed with having to buy add-on products to get the functionality they are seeking. For more information on reviews, see our Zoho review article. If you’d like to try a CRM that allows you to manage sales, marketing and orders in one system, sign-up for a free trial with Zoho today. You can also sign-up for its free plan, which accommodates up to three users. amoCRM is CRM and sales management software, which includes advanced sales automation tools such as the ability to automatically focus incorporated social media ads on specific prospects and send resulting leads directly to specified users once they’ve reached a certain stage in the pipeline. It’s best for sales managers that have created a sales strategy and want it implemented in their CRM using automation. amoCRM is affordably priced, starting at $15 per user, per month for the base plan. Even at the Enterprise level, the pricing is very competitive at $45 per user, per month. AmoCRM pricing allows small businesses to take advantage of sophisticated CRM tools at budget-friendly prices. The Base plan is the starter plan, offering sales pipelines with customizable stages, activity reports to monitor sales activities and the ability to define user groups and set permissions accordingly. Similar to Insightly, it also comes with a business card scanner, which allows sales reps to scan business cards. Unlike the Insightly Business Card scanner, amoCRM’s tool allows scanned cards to become contacts automatically. The Base plan is the best option for sales managers looking to set up and customize pipelines and corresponding stages for their sales teams to follow. It’s also best for teams that do in-person prospecting and collect business cards. Pricing is affordable at $15 per user, per month and comparable to Zoho’s and Freshsales’ base plan pricing. The Advanced plan builds on the base plan offering advanced features like business process auto-created tasks, digital pipeline automation and sales forecasting. It includes the ability to triggered sales activities like Facebook ads shown to prospects when they’ve progressed to a certain stage and route resulting leads to appropriate team members for follow-up. However, this plan lacks lead scoring found in other programs like Freshsales. This plan is priced at $25 per user, per month, which is comparable to Zoho’s Professional plan and Insightly’s Plus plan. It’s a great option for sales managers who want to automate their sales processes and keep their sales team focused on specific selling activities. The Enterprise plan builds on the other two plans. The main differences are expanded storage and records, more advanced security options and lead scoring. These features allow teams to store more data, accommodate more records and offer an added layer of security. Lead scoring allows teams to focus on the most important leads. This plan is priced affordably at $45 per user, per month and is great for teams with lots of prospects and corresponding records. It’s suitable for sales managers who want to score their leads and direct their sales teams’ activities around the most promising leads. AmoCRM lacks lead scoring, except in its enterprise-level plan, which puts it at a disadvantage compared to tools like Freshsales. It also lacks the ability to manage projects resulting from successful bids as is offered by Insightly or process invoices within the tool like what is found with Zoho. Users like amoCRM because it is affordable, easy to use and has rich and unique features that help streamline sales activities. There are very few things people seem to dislike. For more information on reviews of this product, read our amoCRM review article. If you’re looking for a CRM that will allow you to automate sales activities in your pipeline, check out AmoCRM. Its productivity tools like the business card scanner will help your sales team save time. It offers a 14-day free trial. Sign up today to get started. Salesmate CRM is sales management software with a built-in VoIP designed for telesales. What makes it unique is that it has text message tracking as well as phone call tracking. It also includes two-way email integration and workflow automation. It is, therefore, best for sales managers that depend on calling and texting as part of their outreach strategy. Salesmate CRM is only $12 per user, per month billed annually or $15 per user, per month billed monthly and is one of the most affordable sales management systems. There are no pricing tiers, product limitations or contracts. It also offers a 15-day free trial and as well as virtual phone numbers billed only by minutes used. Salesmate CRM offers essential and advanced features sales managers need to manage their teams effectively. Key features include built-in virtual phone and text messaging, integrated email and workflow automation. What makes Salesmate different from Freshsales and Zoho is that text messaging features are fully integrated into the platform. To get this functionality in Freshsales or Zoho, you’d need to use additional apps. The built-in VoIP system offers inbound call distribution that routes calls across sales teams based on availability. It also offers click to call, voicemail and phone number assignment. It offers call recording to monitor and provide individual call feedback to their sales team as well. Instead of using a separate phone system, salespeople can make phone calls from their laptops or smart devices. Sales activity tracking allows sales managers to assign tasks to team members. It also helps keep track of your teams’ historical and upcoming activities for prospects and deals. This tool also generates personalized to-do lists that sync with calendars and mobile devices so that team members stay on top of their sales activities, similar in function to Freshsales’ task and activity management features. This sales management software also includes integrated email where emails can be sent and received from within the tool. Other email tools include email tracking where open and click-through rates are tracked. This allows sales managers to analyze emails and offer feedback to make improvements. Email template features also allow sales managers to create and distribute tried and tested email templates to their teams. Salesmate CRM includes unique call reports, which cover metrics like the number of calls users make, total talk time and call outcome, in addition to more common reports like sales forecasts found in other CRMs. There is also an individual dashboard that shows real-time performance versus their periodic sales goals and a sales leaderboard showing how each individual rep compares against other team members. Salesmate CRM is missing lead scoring. Being able to score and rank leads is critical to sales management because sales managers are better able to direct what leads their sales reps work first. Lead scoring is possible with app integration. However, it is easier when the functionality is built-in. If this is important, consider Freshsales which offers lead scoring and a built-in phone. Overall, users like Salesmate CRM. They like that the solution is very comprehensive offering an advanced set of tools while remaining affordable and easy to use. Most of the dislikes were due to a few experiences of the system being a bit slow and small bugs from time to time. Salesmate’s built-in text message tracking, built-in VoIP and call-centric reports make it a great fit for telesales managers. If the prospects in your industry communicate by phone and text and you’d like to see how Salesmate CRM’s phone and text messaging capabilities can benefit you, sign up today for a 15-day free trial. The best sales software is easy to use, affordable and has all the tools you need to manage your sales team’s selling activities. Whether you are looking for a sales management tool with an integrated phone system that has call recording features, one that offers the ability to establish and grow long-term relationships or one that allows you to plan and divide your team into territories, one of these six solutions will meet your needs. Managing your sales team and their selling activities effectively is much easier and more productive with sales management software. Freshsales helps sales managers monitor sales activities, track results and help prioritize sales activities. Give Freshsales sales management software features a try by signing up for a free trial. Email Prospects Right From Your CRM!